Kenny (Rufus) Smith acquired his first drum set when he was only 8 years old. He began taking lessons shortly after from one of the major influences of his drumming career, Bobby Domings of The Bobby Domings Drum Studio in Chandler, Arizona. Once in high school, he joined the drum line and has been drumming incessantly ever since. In 2008 a mutual colleague suggested that Kenny may be a good fit with Ghazaal Beledi and henceforth Kenny became known as the Baron of Boom at the Arizona Renaissance Festival. 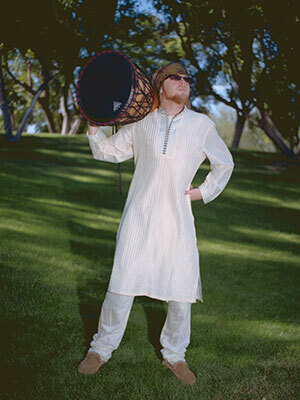 Kenny has since picked up several different hand drums, bass, and can even be heard contributing vocals to the Ghazaal Beledi band. Kenny is currently delving more into the world of studio drumming, DJ-ing, and trying to stay on the dancers' good sides.